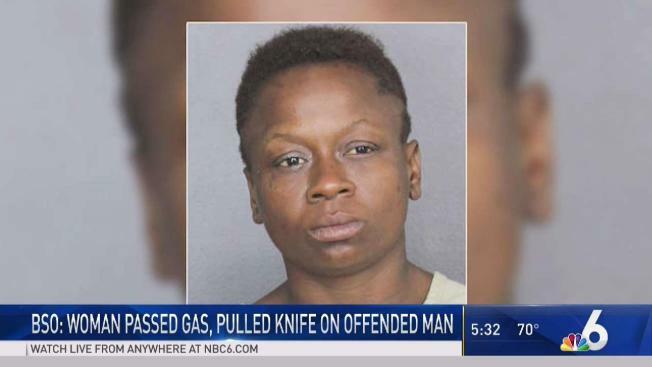 The report says the offended customer and Wilson then got into an argument "in reference to the defendant farting loudly"
A South Florida woman faces an aggravated assault charge after authorities say she passed gas in line at a Dania Beach dollar store and pulled a knife on a man who complained about it. Citing a Broward Sheriff's Office report, the Miami Herald reports 37-year-old Shanetta Yvette Wilson passed gas while waiting in line at a Dollar General Sunday night and upset a nearby customer. The report says the offended customer and Wilson then got into an argument "in reference to the defendant farting loudly." It says Wilson then pulled a small folding knife out of her purse and told the victim she was going to "gut" him while moving as if to attack him. She walked away from the area but was found by deputies a short time later, the report said. Wilson was arrested and charged with aggravated assault with a deadly weapon without intent to kill and booked into jail. It's unclear if she has a lawyer.